Once considered a nice bonus feature, but certainly not standard, kitchen islands have become an essential design element in the minds of the vast majority of homeowners. Browse real estate listings and you will find that they are as desirable as kitchen cabinets with a high-end finish. And they have evolved a great deal from the classic rectangular shape with a granite countertop, flanked by the requisite bar stools. 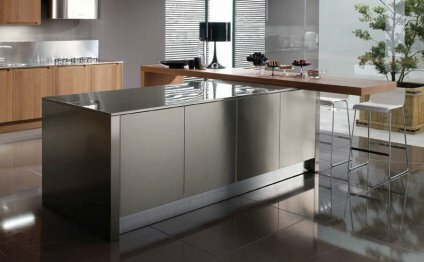 Islands designed for contemporary kitchens range from modest to grand, classic to edgy and expansive to compact. Homeowners are limited only by their imaginations. Certain design ideas stand out from the rest. The following concepts are worth a closer look. The nautical look of an island designed to loosely resemble a sailboat goes perfectly with the classic look of white shaker cabinets so many homeowners favor. To clarify, this type of island does not look exactly like a sailboat; rather, its clean lines, white base and glossy dark wood counter top invoke images of the vessel and feelings of a serene day out at sea. It is also an ideal match for a kitchen with a minimalist design theme. Gone are the days when every island was rectangular. Circular and oval islands are great options for small kitchens in particular, as they conserve space, but they can add appeal to kitchens of any size. A skilled designer can incorporate cabinets that flow perfectly with the shape while providing plenty of storage space. Circular and oval islands also blend well with a large range of design schemes, from edgy ultra-modern to quintessential country. A unique, stunning island can become the centerpiece of the kitchen. Designers have incorporated everything from an aquarium to a tree trunk into islands to create lasting impact. The latter is transformed into an island through flattening the tree trunk and affixing it to a concrete slab complete with twin cooktops and a sink. And the flat top of the trunk can be used as an additional prep area, making this island both functional and a sculptural piece. Tucking book shelves into the ends of an island adds a fresh twist as well as increasing storage space for cookbooks – or any other book you wish to keep within easy reach. Homeowners can opt for built-in shelves or shelves on wheels they can roll next to the table, near workspaces or even to another room. An island that appears to extend from a home bar and float in mid-air is a guaranteed conversation starter. Consider the impact as guests enter the kitchen and then try to figure out how it was done. In many cases, steel beams anchored inside of the counter maintain its structural integrity while preserving the striking aesthetic. The bonus? A floating island also leaves plenty of leg room available. Instead of regulating your island to a seating or prep area, expand its utility with cabinetry that features built-in organization systems for your utensils and dishware. The custom design of these systems allows homeowners to store just about any cooking, serving or dining item in drawers and cabinets while keeping everything neat and tidy. Designers can even install multiple levels of pull-out shelves within these spaces to further enhance convenience and order. Whether you are a wine aficionado or simply like to savor a glass from time to time, building a mini wine refrigerator into your island is an appealing notion. Not only does it conserve space in the main work areas of the kitchen, but it also keeps the wine within easy reach of both family members and guests, saving time during busy evenings and lively dinner parties. While the idea of using an island as a place to sit and eat is not revolutionary, the concept of using it to create additional seating for socializing may catch your attention. The aforementioned floating island and an island with legs (as opposed to an island with a solid base) work best in this design scenario. The key to pulling it off is selecting low profile seating that can slide underneath the counter top, simultaneously enhancing the social aspect of the island and conserving space in walkways of the kitchen when seating is not in use. Repurpose wooden barrels into an island that is both rustic and elegant. Picture an English country manor house garden. The number of barrels used depends on the amount of square footage available as well as the look for which the homeowner is aiming. Whether you use one barrel or three, you can top it off with granite or marble counter affixed to the opening. With the wealth of options available in the design space, the modern island can elevate the overall aesthetic of your kitchen. Designers have access to more resources, materials and tools than ever before to create an island that achieves the purposes for which this feature is ideally intended – anchoring the entire design scheme of your kitchen and improving its level of functionality. The sixth season of the American reality television competition series HGTV Design Star premiered July 11, 2011. The two major additions to the show were Tanika Ray as host, and David Bromstad as mentor. Beli Dvor (Serbian Cyrillic: Бели двор; English: White Court or White Palace) is a mansion located in Belgrade, Serbia. The mansion is part of the Royal Compound, a real estate of royal residences and parklands located in Dedinje, an exclusive area of Belgrade.